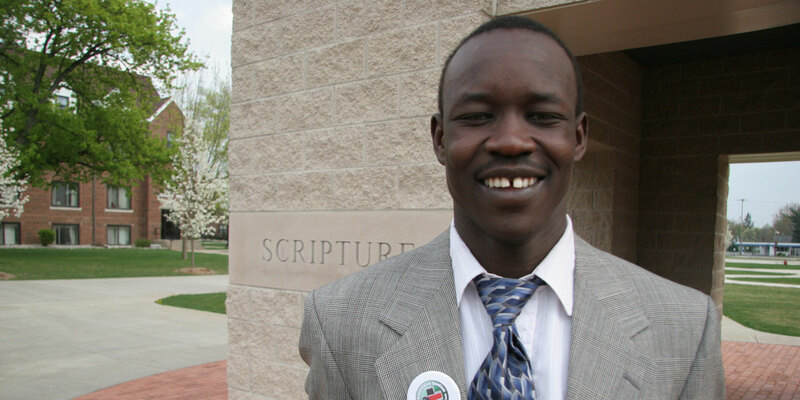 WASHINGTON – The Council for Christian Colleges & Universities is pleased to announce that Dr. Jacob Atem, a 2008 graduate of Spring Arbor University and the co-founder, president, and CEO of the Southern Sudan Healthcare Organization, has been named the 2019 CCCU Young Alumni Award winner. The award will be presented on Wednesday, Jan. 30, during the 2019 CCCU Presidents Conference in Washington, D.C. The CCCU Young Alumni Award is presented to individuals who have graduated within the last 10 years and have exhibited uncommon leadership or achieved notable success in a way that reflects Christian higher education. Last year’s recipient was Angie Thomas (Belhaven University), author of the New York Times bestseller The Hate U Give. Atem’s passion for helping others and his love for South Sudan stems from his own experience as one of Sudan’s Lost Boys. Atem was 6 when his parents and several of his siblings were killed by northern Sudanese Arab militias waging war on Southern Sudan. After walking over 2,000 miles with other lost boys, he found refuge in Kenya before coming to the United States at 15. With the support of his foster family in Michigan, he graduated high school and went on to study at Spring Arbor University (SAU), where he experienced the antithesis of his lost boy experience: a welcoming community of faith, full of mentors and friends ready to invest in his life. After personally witnessing the effects of malnutrition and disease, his experience in America propelled Atem to continue his education in order to give back. In the midst of his studies, Atem co-founded the Southern Sudan Healthcare Organization (SSHCO) and raised $800,000 toward building a clinic in his hometown. Today, SSHCO sees over 3,000 patients monthly for less than $5 a person, fulfilling Atem’s hope of bringing hope to where it is lost. After Spring Arbor, he continued his education by earning a Master of Public Health at Michigan State University and, eventually, a doctorate in Environmental and Global Health at the University of Florida. Atem is currently a postdoctoral Fellow at Johns Hopkins Center for Humanitarian Health. In addition to naming Atem as the winner, Chrissie Thompson Fink, a graduate of Taylor University and the current education editor at USA Today, was recognized as a runner-up for her creative journalistic abilities to address some of the most pressing issues of our time. Fink and her team at the Cincinnati Enquirer received the Pulitzer Prize for Local Reporting for their piece entitled, “Seven Days of Heroin.” Under Fink’s leadership, the story catalogs a week in 2017 during which over 200 heroin users were jailed, 15 babies were born with drug-related health issues, and 180 heroin overdoses took place, showcasing the pervasive nature of the drug epidemic. Sayra Garcia Lozano, a graduate of Southeastern University who was selected as one of two delegates to represent DREAMers at the United Nations earlier this year, was also recognized as a runner-up for this award. During her collegiate and graduate career at Southeastern University, Lozano used her own story as an immigrant and a DREAMer to advocate for protections for others, like her, who were brought to the U.S. as children. In addition to sharing her story through numerous media outlets, including the New York Times, Washington Post, and the Los Angeles Times, Lozano has advocated for dreamers directly with members of Congress.